Continuing medical education (aka CME) is a requirement for physician recertification, and there are many different means to obtain it, including online. Medscape is probably the largest online CME provider and by means of smart phone and tablet applications, email reminders and just plain old web visits, it undoubtedly services thousands of physicians daily. So let me ask you, if you're a physician and you're using Medscape to try to stay at least partially up to date with the latest literature, and you inherently trust Medscape as a reputable source of quick, expertly vetted information, how frustrating might it be to learn that at least in regard to nutrition, Medscape doesn't know what it's talking about? Well, I've got bad news for you. Looking at the 3 most recent observational study failures, where the studies were so poor as to make conclusions impossible, 2 of the 3 made it to Medscape as CME exercises, and one was put out in their news to family physicians segment. I blogged about all of these studies. There was the diet soda being linked with strokes study, the white rice being linked with diabetes study, and the chocolate being linked with weight loss study. 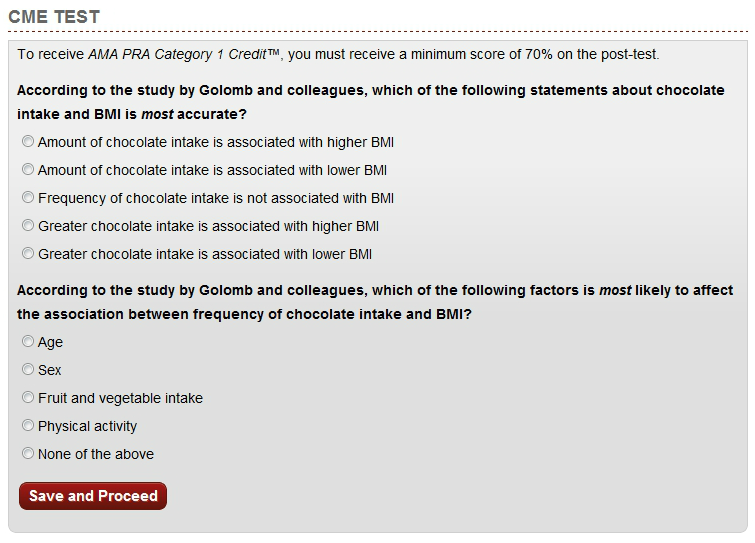 Of the 3, the worst was probably the chocolate study which frankly never should have been published. And what did Medscape do with the study? 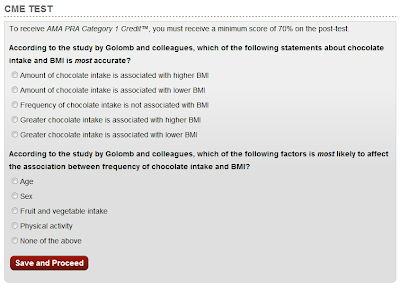 "Greater frequency of chocolate intake is associated with lower BMI, but the amount of chocolate intake is not associated with BMI"
I do feel badly publicly bashing a free service, but know that I tried the quiet route first. Following Medscape's inclusion of the diet soda study in their family practice newsletter, I wrote to them to express my concerns. I never did hear back from them and certainly no correction was ever sent out. While Medscape in theory is a fabulous service, if their understanding of other areas of medicine is on par with their understanding of nutrition, in practice they're putting patients at risk by actively misinforming their physicians. Given I have no reason to think otherwise I'm going to err on the side of caution and assume the same lack of care, attention and critical appraisal they're paying nutrition is their norm. Stop using their services or simply assume that their take on medical literature isn't in any way, shape or form, critical, thoughtful or helpful.